← Don’t Look Like a Trick Getting a Treat! It’s time for couples to start the Halloween negotiations. If there’s a “costumes only” party on tap this weekend or a party, the question is: What will you and your partner wear? 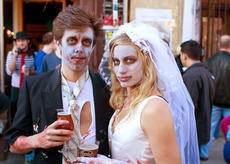 Will you dress up as a duo (Barney & Wilma, a pair of pirates, a zombie duo, Angelina & Brad), or will you go with separate looks?It might seem insignificant, but research has shown what couples wear on Halloween may reveal fundamental markers of relationship success.For years, researchers have conceptualized love as a merging of two people. When two people form an attachment, they share aspects of their selves with each other, and each partner’s sense of self grows through their interactions. To fall in love is to self-expand and to self-expand is stretch who you are to include your partner. Aron and colleagues (1991) termed this merging as inclusion of other in the self, and evidence consistently shows that such merging is associated with positive relationship factors, one of which is feelings of closeness and connection. So how does this connect with Halloween? Halloween costumes could be manifestations of relationship closeness. In public settings, couples have a chance to tell the world something about their relationship. This is not necessarily a deliberate action: We tell the world about our individual selves all the time through how we present ourselves —hair, clothes, gait—and how we behave. It makes sense that we would do the same at the level of our relationship, even if it’s unconsciously. Evidence already supports the idea that, unconsciously, happy couples behave differently than unhappy ones. Couples with higher quality relationships tend to use more inclusive pronouns in everyday conversations, talking about “we” and “us” as opposed me “me” and “I” (Seider et al, 2009). These couples unconsciously reveal their relationship quality by emphasizing their connection and togetherness. More recent evidence shows that showing off your “coupleness” is a natural response for many people in happy relationships (Saslow, Muise, Impett, & Dubin, 2013). This study examined profile photos on Facebook. Regular users who used photos of themselves and their romantic partners as their individual profile photos reported more relationship satisfaction and closeness. It seems that people often celebrate their relationship quality by showing the world how happy they are. Not everyone wants to show off their relationships in a public setting. Do you like telling people about your relationship? Is this something you’re comfortable with? Your answer may reveal something about your views towards relationship visibility, defined as the centrality of a relationship in one’s self-presentation (Emery, Muise, Dix, & Li, 2014). Relationship visibility is all about showing the world that you’re in a relationship. When you and your partner are debating costume choices, consider your individual differences in comfort with relationship visibility. Emery and colleagues (2014) found that attachment styles play a role in desired and actual relationship visibility. Using Facebook, they showed that people with a high degree of attachment anxiety desire a great deal of relationship visibility, whereas people with avoidant orientations tend to prefer independent representations of the self. People high in avoidance aren’t big fans of relationship visibility. Try thinking about Halloween as a part of a couple’s impression management. Dressing up in a matching costume can highlight and reveal closeness and togetherness, the merging of self and other. At the same time, while some people want the world to see that they’re in a relationship—they desire high relationship visibility—others, who may be relationship avoidant, are less comfortable with that idea (Emery et al., 2014). A happy middle ground can be tricky to establish. Keep in mind that relationship anxiety and relationship avoidance, which have been shown to predict high or low desire for relationship visibility, respectively, are not typically linked with a high degree of relationship satisfaction. Indeed, the potential link between relationship security and relationship visibility is still an open question (Emery et al., 2014). That said, there’s some suggestion that secure individuals also desire relationship visibility, but maybe their goals are different. Whereas anxious individuals might use relationship visibility to make themselves feel less anxious and to help their self-esteem (Emery et al., 2014), perhaps secure individuals simply feel safe and happy when presenting themselves as a pair. In sum, dressing as a duo is a decision that may reflect underlying dynamics. Your costume choices may reflect relationship quality and you and your partner’s attachment orientations. This doesn’t solve the costume dilemma—Sorry!—but it does suggest some of the factors that could be at work whether your preference is to go-it-alone or to dress as a duo.